There are, basically, two types of spiders that are found in and around the home. The first type is identified as “hunting” and the second type are identified as “web-building”. In this guide, we will outline the common hunting spiders found in and around the home. Essentially, hunting spiders typically live outdoors; however, they may wander in to the inside of structures as an accidental invader. If you happen to stumble across a hunting spider in your home, it is important to seek the assistance of a pest control specialist as soon as possible. While most hunting spiders cannot kill a human, many have a bite that may prove to be very uncomfortable. Additionally, the sight of such pests in the home may make individuals that live and frequent the home highly uncomfortable. Crab spiders are hunting spiders that are commonly found in and around the home. 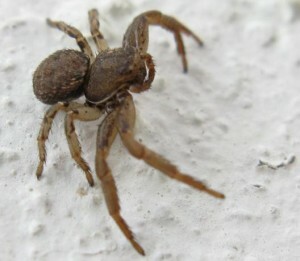 These spiders may be small; however, most are described as being “medium-sized”. These spiders may be yellow, brown, gray, or even red in color. The first section of legs is longer than the second section of legs. This makes them look like crabs. Instead of just walking forward, these spiders may walk backwards and sideways. In most instances, these spiders will sit passively and wait on their prey. The fishing spider is commonly found near or in a body of water – such as a swamp, a stream, or a pond. 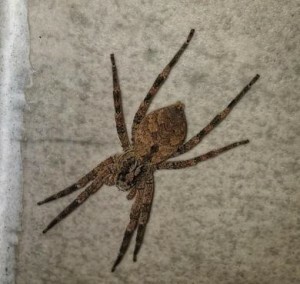 Considered to be the absolute largest spider species in the Midwest region of the United States, these arachnids have the capability of growing up to four inches. The coloring is typically dark. In most instances, the spider will have white marks on its body. These pests may move across, in, and through water. They have the capability of catching insects, tadpoles, and even small fish. While it is unusual for these to be found indoors, they may enter into a home on fishing equipment, clothing, and similar means. 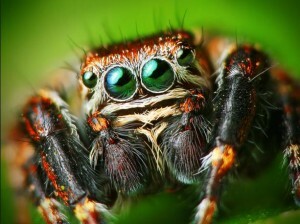 Jumping spiders are medium in size and are capable of jumping several times over their body size. These arachnids are most often active during the day time hours. You will often see the pests in areas that are exposed to the light of the sun. According to studies, these spiders have the absolute best vision of any spider. Tests have concluded that they have the capability of seeing up to eight inches away. It is common to find that jumping spiders are bright in color and have the ability to move in highly erratic ways. In part one of this series, you were introduced to three of the most common hunting spiders found in and around the home – the crab spider, the fishing spider, and the jumping spider. If you have an issue with spiders in or around your house, you should address the problem immediately. We’re qualified to service your home, your lawn, and surrounding structures and areas for the elimination of spiders. For more information, call us today.